I have made a Python script to plot the Doppler and geometry for a DSLWP-B observation. This can be useful for several things: predicting the downlink and uplink Doppler corrections, checking for the Doppler of the Moonbounce signal, checking the position of DSLWP-B in the sky, and studying Moonbounce geometry. A few days ago I discussed the manoeuvre performed by DSLWP-B in preparation for the lunar eclipse. The manoueuvre raised the periapsis of DSLWP-B by around 385km. Wei Mingchuan BG2BHC has now informed me that the manoeuvre was performed on 20 Jul 2018 10:47:09.657. There were two motivations for this manoeuvre: first, to avoid eclipse, as I showed in the previous post; second, as Wei tells me, to prevent DSLWP-B from crashing into the Moon in a few months (more on this in a future post). Wei doesn’t know the delta-v used for the manoeuvre, but estimating it is an easy exercise using GMAT, which is what I will do in this short post. In this simulation I am taking the orbital state for DSLWP-B from the first line of the 20180714 tracking file published in dslwp_dev. I will assume that the manoeuvre was a prograde burn performed at apoapsis that raised the periapsis by 385km. The GMAT script I have used is lunar_eclipse_manoeuvre.script. First I propagte the orbit to the date mentioned by Wei. I note that the spacecraft is a little short of apoapsis, so I propagate to apoapsis, which happens at 20 Jul 2018 10:49:33.178 UTC. Then I propagate to periapsis and take note of the periapsis radius, which is 3030.91km. Finally, I use GMAT to estimate a burn that will achieve a periapsis radius of 3415.91km using a differential corrector. The differential corrector finds a delta-v of 17.2m/s. The iterations of the differential corrector can be seen in the figure and text below. A more difficult exercise is to find a burn that stitches together the orbits described by the 20180714 and 20180727a tracking files. I will leave this as an exercise for the reader. Something very similar was done in DSLWP-B’s journey to the Moon: part II. As you may well know, last Friday 27th July there was a total lunar eclipse. This is an interesting event for lunar-orbiting spacecraft such as DSLWP-B. In fact, depending on the spacecraft’s orbit, it may also pass through the Earth’s umbra or penumbra. Here I look at the trajectory taken by DSLWP-B during the eclipse. 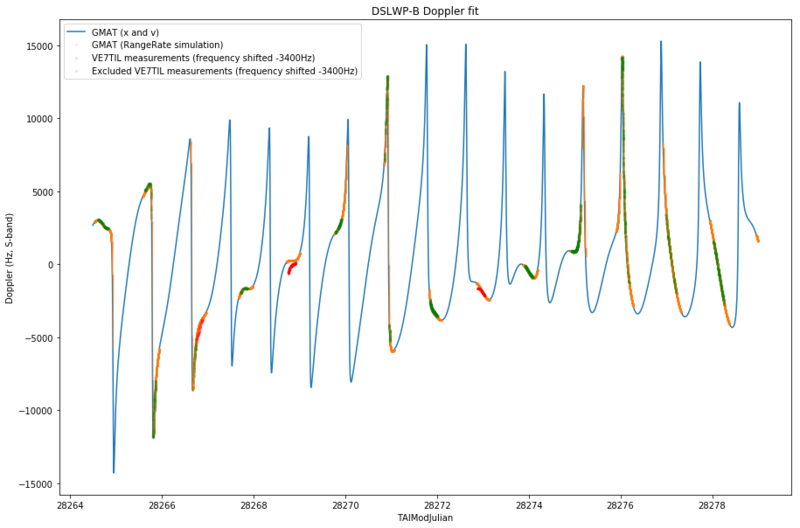 In the last post I compared the results of my orbit determination for DSLWP-B using one lunar month of Doppler data with the observations in the VLBI experiment done on June 10. 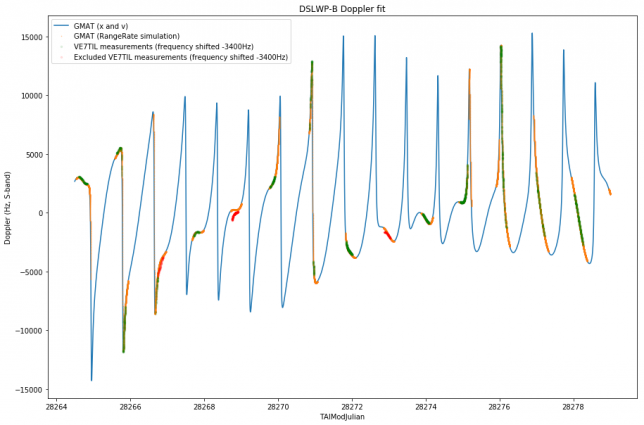 In this post I will compare my orbit determination with the tracking files published by Wei Mingchuan BG2BHC in gr-dslwp. These tracking files are produced from the orbit determination performed by the Chinese Deep Space Network using two-way S-band Doppler measurements. The tracking files contain a listing of the position \(x\) and velocity \(v\) vectors for DSLWP-B in ECEF coordinates. The entries are given at intervals of one second. The tracking files can be used directly to compute Doppler as received in a groundstation. In fact, if the ECEF coordinates of the groundstation are \(x_0\), then \(R = \langle x – x_0, v\rangle/\|x-x_0\|\) is the range-rate, and so the Doppler can be computed as \(D=-fR/c\), where \(f\) is the downlink frequency and \(c\) is the speed of light in vacuum. Here I have used this method to compute the Doppler according to the tracking files. All the tracking files published so far have been considered in this study, except for the first two, which contained an incorrect anomaly at epoch. 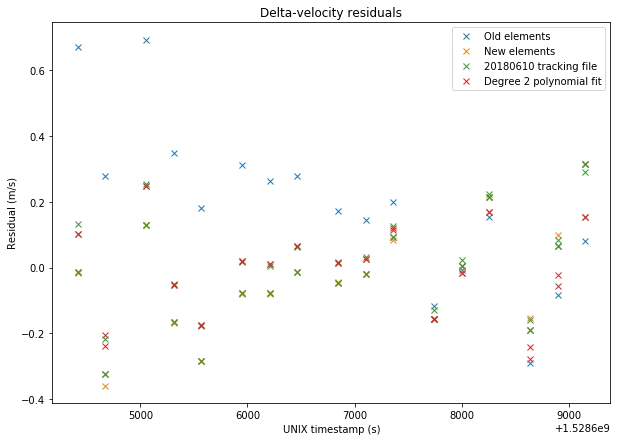 The figure below shows the residuals between the Doppler measurements made by Scott Tilley VE7TIL and my orbit determination (called “new elements”) and each of the tracking files. It seems that the residuals are quite similar. The figure below shows the difference between the Doppler according to each of the tracking files and the Doppler predicted by my orbit determination. It seems that the match is quite good for the central days, but not so good towards the edges. My orbit determination is numerically propagated from a single set of elements at MJD 28264.5 for the whole period, while the tracking files probably use different sets of elements that are propagated numerically over a few days only. Therefore it might happen that my orbit determination is affected by some accumulative error due to numerical integration or an inaccuracy in the force model. 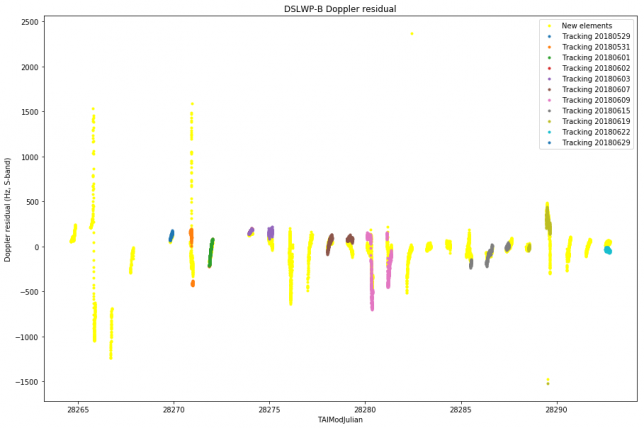 In my last post I presented my orbit determination of DLSWP-B using one lunar month of S-band Doppler measurements made by Scott Tilley VE7TIL. 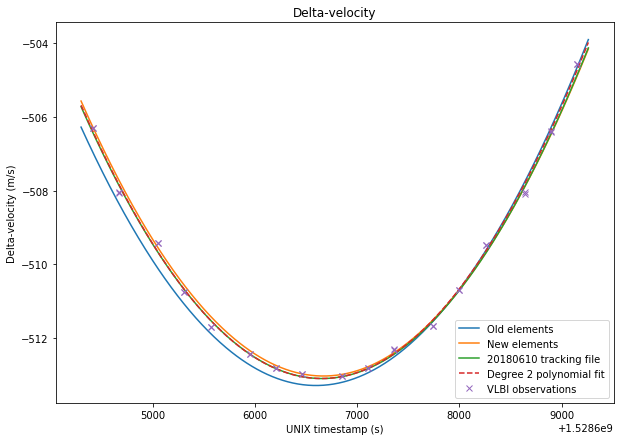 In this post, I will use the delta-velocity measurements from the VLBI experiment on 2018-06-10 to validate my orbital elements. The elements obtained from the 20180610 tracking file published by Wei Mingchuan BG2BHC in dslwp_dev. This tracking file contains a list of ECEF position and velocity vectors for DSLWP-B. The first entry is taken as the orbital state and the orbit is propagated in GMAT, as done in this post. It would also be possible to calculate the delta-velocity directly from the ECEF data, but the results would be fairly similar and I already have a script to do it with GMAT orbit propagation. A degree 2 polynomial fit to the VLBI observations. It turns out that the delta-velocity during the VLBI experiment can be approximated fairly well by a parabola, so it makes sense to use this as a reference. Note that this also implies that this set of delta-velocity measurements alone would be insufficient to perform orbit determination, as a degree 2 polynomial gives us 3 coefficients, while we would need to determine 6 parameters for the orbital state. 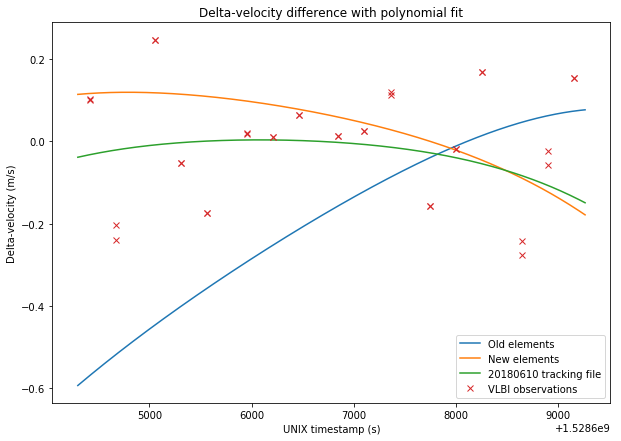 Adding delta-range would only give us an extra variable, so orbit determination using VLBI would need several sets of measurements well space in time so that the orbit can be observed at different anomalies. The figures below show a comparison between the four sets of data and the VLBI measurements. The RMS errors are respectively 0.248m/s for the old elements, 0.167m/s for the new elements, 0.156m/s for the tracking file, and 0.137m/s for the polynomial fit. Thus, we see that the newer elements represent a good improvement over the older elements. The tracking file gives a slightly better result than the new elements. However, the new elements should give good results over a long time span of over 20 days, as we have seen in the previous post, while the orbital parameters derived from the tracking files tend to change often. The Jupyter notebook used to make these calculations has been updated in here. DSLWP-B has now been for more than a month in lunar orbit, since the orbital injection was made on May 25. Scott Tilley VE7TIL has sent me his latest batch of S-band Doppler measurements, including data for all this first lunar month. Having a complete lunar month of data is interesting for orbit determination purposes, since it gives observability of the orbit from all possible right ascension angles. I have run my orbit determination with the new data. Last Sunday, I used Scott Tilley VE7TIL’s Doppler measurements of the DSLWP-B S-band beacon to perform orbit determination using GMAT. Yesterday Scott sent me the Doppler data he has been collecting during this week. I have re-run my orbit determination process to include this new data. Below I show the Keplerian state that was determined on 2018-06-03, in comparison with the new state determined on 2018-06-10 (both are referenced to the same epoch of 2018-05-26 00:00:00 UTC). It seems that there is still an indetermination of a few degrees in the inclination and right-ascension of the ascending node and a few kilometres in the semi-major axis. The graph below shows the Doppler fit. The Jupyter notebook where these calculations are performed can be found here. 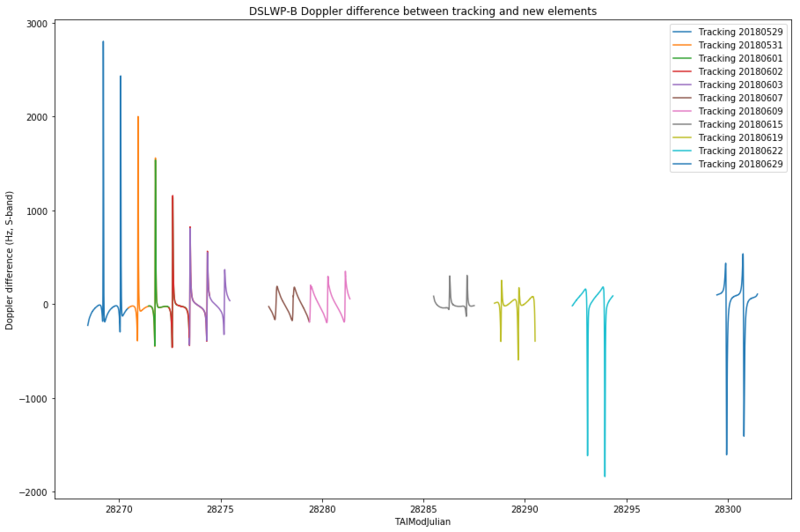 This is a follow-up on the series about DSLWP-B’s orbital dynamics (see part I and part II). In part I we looked at the tracking files published by Wei Mingchuan BG2BHC, which list the position and velocity of the satellite in ECEF coordinates, and presented basic orbit propagation with GMAT. In part II we explored GMAT’s capabilities to plan and perform manoeuvres, making a tentative simulation of DSLWP-B’s mid-course correction and lunar orbit injection. Now we turn to the study of DSLWP-B’s elliptical lunar orbit. In this post we will examine the Keplerian elements of the orbits described by each of the tracking files published so far. We will also use Scott Tilley VE7TIL’s Doppler measurements of the S-band beacon of DSLWP-B to validate and determine the orbit.